Chris Dodd has written a beautiful article on Hear the Boat Sing about Beryl Crockford Cast in Coin. British Rowing will add a new medal to its portfolio of awards in February 2018. The Beryl Crockford Medal is the inspired idea of Beryl’s husband Duncan while coming to terms with her tragic death in a cycling accident. Beryl was nothing if not inspirational, whether as a competitor, a coach, a teacher, a mother, a partner, a human being or someone to be around, and the idea of the annual medal – and two others designed for the schools that she took to the top of the rowing game – is to be a legacy as well as a memorial. Sydney High School for Boys Beryl Crockford Medal. Image courtesy of Duncan Crockford. The first girl to receive the Beryl Crockford Medal at Lady Eleanor Holles was Hasna Virk. The first boy from Sydney High School for Boys to receive the Beryl Crockford Medal, which is ‘Awarded to a rower from Years 8-12 who possesses the ideal qualities required to be a champion rower’, at Sydney High School was Thomas Schanzer. The British Rowing medal has five words describing the qualities that Beryl lived by and valued in her athletes on its backside: Imagine, Inspire, Educate, Collaborate, Innovate. The medals for Sydney High and Lady Eleanor Holles invoke Imagination, Commitment, Initiative, Empathy and Humility. 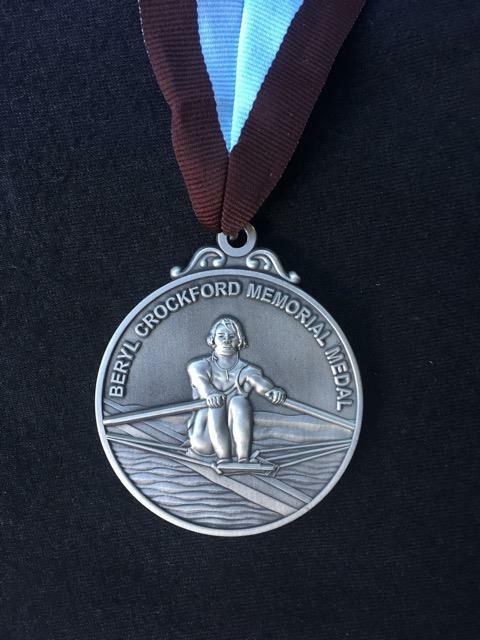 British Rowing’s Beryl Crockford Medal. Image courtesy of Duncan Crockford. This entry was posted in Rowing and tagged beryl crockford, British Rowing, lady eleanor holles school rowing, rowing medal, sydney high school for boys rowing.